Osteoradionecrosis of the jaws is one of the most serious oral complications of head and neck cancer radiation therapy. It is a self-progressive process of bone destruction that is very difficult to treat. In this report, four patients who are susceptible to osteonecrosis of the jaw presented for endodontic management of nonrestorable teeth. The first patient had two molar teeth with necrotic pulp and was treated with nonsurgical root canal therapy (NSRCT) followed by crown amputation and hemisection. The second patient had a molar tooth that was previously treated with acute apical abscess. Crown amputation and hemisection were performed. The third patient had a molar tooth with necrotic pulp and asymptomatic apical periodontitis. NSRCT followed by occlusal reduction were completed. The fourth patient had a molar tooth with necrotic pulp and symptomatic apical periodontitis. NSRCT and crown amputation were performed. All cases had a minimum recall of 12-months. The tooth in case #1 developed a periapical pathosis, and other teeth in case #1–#3 had healing of periapical lesions. The tooth in case #4 was exfoliated. None had developed osteonecrosis. These results suggest that NSRCT is the treatment option to manage nonrestorable teeth in postradiation patients or patients taking bisphosphonate drugs to prevent osteonecrosis. Osteonecrosis of the jaws has reported with a number of different predisposing conditions that affect bone metabolism and/or healing. Osteoradionecrosis (ORN) of the jaws is one of the most serious oral complications of head and neck cancer radiation therapy. It is a self-progressive process of bone destruction that is very difficult to treat., The risk of osteonecrosis has also been reported following prolonged use of bisphosphonate drugs and other antiresorptive agents/anticancer drugs and recently given the term medication-related osteonecrosis of the jaw (MRONJ). Although osteonecrosis of the jaws can develop spontaneously in these patients, the risk increases following invasive dental procedures that expose alveolar bone, especially extractions., Furthermore, patients with trauma-related and spontaneous bisphosphonate-related osteonecrosis of the jaw (BRONJ) have healed faster compared with those developing BRONJ after extraction. Therefore, avoiding extractions using nonsurgical root canal therapy (NSRCT), and restoration has been recommended when those patients have teeth with pulpal and apical diseases., This recommendation was originally applied to restorable teeth, and extraction was still recommended for nonrestorable teeth. In fall 2012, the American Association of Endodontists addressed dental management of patients taking bisphosphonate drugs (Available at www.aae.org; Endodontics Colleagues for Excellence, Fall 2012). Their recommendations included performing nonsurgical endodontic therapy on teeth that would otherwise be extracted, and when necessary, performing crown amputations and restoration of roots, then allowing the roots to exfoliate. Tooth extractions should be avoided, if possible. It is well documented that teeth with pulp and periapical diseases can be managed successfully by numerous endodontic procedures. Despite the recommendations for endodontic therapy, only a limited number of outcome studies on endodontically treated teeth in MRONJ patients have been published. One author focused on teeth that were restorable following radiation therapy. They reported that 91% of 22 teeth followed for a mean of 19 months after endodontic therapy were considered successful. Another radiation study of 35 teeth included 19 teeth that had extensive loss of coronal tooth structure and were considered nonrestorable. Instead of extraction, endodontic therapy was completed, and the crowns were amputated at or below the level of the gingiva. Their 2-year endodontic success rate on crown-amputated teeth was only 40%, but 85% of the roots survived. Eight of the roots exfoliated spontaneously or were extracted. None of the patients developed osteonecrosis. Additional data are needed to confirm that the treatment recommendations are appropriate, especially for patients who undergo crown amputation as part of the therapy. The purpose of this paper is to report and discuss endodontic management on nonrestorable teeth in patients who are susceptible to osteonecrosis of the jaw. A 74-year-old male presented with extensive carious involvement and calculus formation on lower first and second left molar; tooth 36 and 37 [Figure 1]a. Both teeth had pain with percussion and did not respond to cold test (Endo Ice; Hygenic Corp, Akron OH) used with #4 cotton pellet applied on the occlusal surfaces. A periapical radiograph showed subgingival caries was present on both teeth, and a periapical radiolucency was associated with both roots of tooth 36 [Figure 1]b. The patient reported symptoms of occasional dull aching that perhaps related to the periodontal and pulpal disease of teeth in the area. The patient had a history of treatment of squamous cell carcinoma of the throat 2 years previously. His treatment included a tracheostomy, laryngectomy, and radiation therapy (6000 rads to the mandible). A diagnosis of necrotic pulp with symptomatic apical periodontitis was made for both teeth. The patient's radiologist and faculty members from the Periodontics and Prosthetics Departments were consulted. A treatment plan, which included NSRCT on both teeth, followed by crown amputations, was presented, accepted, and signed the consent form. To facilitate rubber dam placement on teeth 36 and 37, caries removal was completed, followed by placement of a glass ionomer restoration (Fuji II LC, GC America, Chicago, IL, USA), prior initiating endodontic treatment. Standard NSRCT was completed using conventional access. The working length was determined using Root ZX apex locator (Morita Corp, Irvine, CA) with a size 10 K-file (Dentsply Maillefer, Switzerland). The instrumentation was performed with K3 rotary files (Sybron Endo, Orange, CA) to size 35/0.04 or 40/0.04 in the mesial-distal canals, respectively. Irrigation was used throughout, with copious 6% sodium hypochlorite (Regular 2; Inter-Med, Inc./Vista Dental Products, Racine, WI), and a final rinse with 17% EDTA (Smearclear; Sybron Endo, Orange, CA). Canals were then filled with warm vertical compaction of Gutta-percha (Sybron/Kerr, Romulus, MI) and AH plus sealer (Dentsply Maillefer, Switzerland) using a System B (Sybron Endo, Orange, CA) and an Obtura gun (Obtura Spartan, Fenton, MO). Unfortunately, an overfilling occurred during the obturation of the mesial root of tooth 37 [Figure 1]c. The access cavities of both teeth were restored with flowable-condensable composite, (Premise Flowable, Kerr Corporation, Orange, California). Next, both crowns were removed to the gingival level using a diamond coated tapered fissure bur (Chamfer Diamond 878, Brassler Co., Savannah Ga., USA) in a high-speed handpiece, with copious irrigation. Due to extensive caries in the buccal surfaces on both teeth and to provide access for plaque removal by the patient and for professional maintenance, the same bur was used to section through the furcation and created two separate roots [Figure 1]d.
The patient was recalled 19 months later. All four roots were still present, with no gingival inflammation, no caries, and no evidence of supra-eruption. The composite restoration in the mesial root of tooth 37 had been lost. A periapical radiograph revealed healing of the periapical lesions associated with tooth 36. However, the overfilled Gutta-percha in the mesial root of tooth 37 appeared to be separated from the Gutta-percha in the root canal, and a periapical lesion with possible apical root resorption had developed [Figure 1]e. Treatment options were discussed, but the patient elected to forgo further treatment. A 68-year-old female presented with a chief complaint of a dull ache and Class II mobility associated with lower left first molar, tooth 36. The patient's medical history included osteoporosis, which had been treated with IV bisphosphonate (Reclast) once/year for the past 3 years. The dental history of the tooth included NSRCT, followed by crown lengthening to create adequate margins for restoration, followed by construction of a full gold crown. All the treatment was completed approximately 4 years previously. The periodontal probing depths were all 2–3 mm except on the mid-buccal which had a 6 mm pocket and class II furcation involvement [Figure 2]a. The lingual gingival had erythema and swelling [Figure 2]b. The tooth was painful to percussion. 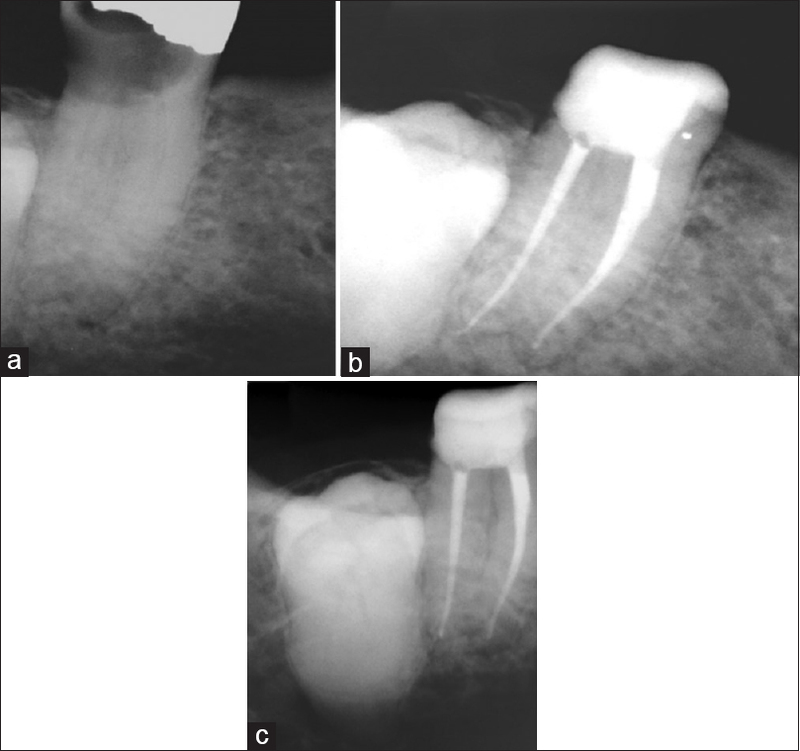 The pretreatment radiograph showed that adequate root canal therapy, with some sealer extrusion associated with the distal and mesiolingual roots. A periapical lesion was associated with mesial root [Figure 2]c. Teeth 34 and 35 responded normal to cold tests and showed intact periapical structures radiographically. A diagnosis of previously treated canals with acute apical abscess due to the primary periodontal lesion was made. After consultation with the periodontal and oral Surgery clinicians, a treatment plan of decoronation and hemisection were proposed and accepted. The crown was removed and the occlusal surface of the remaining tooth structure was flattened. The furcal tooth structure was removed using a diamond coated fissure bur in a high-speed handpiece with copious water irrigation. Core buildup was intact. Two roots were created, with a blood clot formed between them [Figure 2]d and a radiograph was taken [Figure 2]e. A radiograph taken at 4 years recall showed complete healing of the bone [Figure 2]f, and the clinical photograph showed excellent gingival color and contour [Figure 2]g.
A 79-year-old female was referred to extract lower right second molar, tooth 47. She had osteoporosis and been taking oral Fosamax for 5 years but had stopped 4 months previously. The tooth had caries extending subgingivally on the buccal surface of the root, and there was no opposing tooth. It was asymptomatic but nonresponsive to cold test, as previously mentioned. The periradicular tissues appeared to be normal on radiograph [Figure 3]a. A diagnosis of pulp necrosis and asymptomatic apical periodontitis was made. An oral maxillofacial surgeon was consulted. 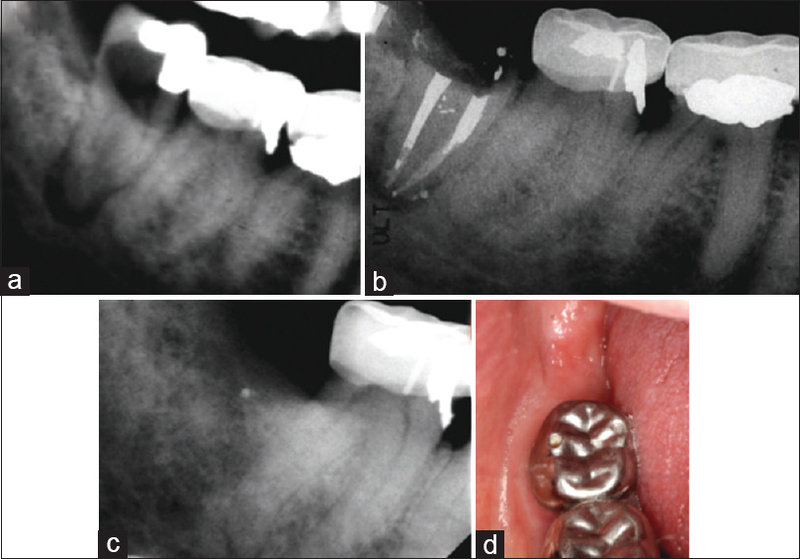 The potential complications following extraction included BRONJ and development of an oral communication with impacted third molar were discussed. The patient elected to approve a treatment plan of NSRCT and direct coronal restoration, with continued observation of the third molar, tooth 48. To facilitate coronal buildup for proper isolation, a buccal gingivectomy was completed. The buccal caries was removed, and the cavity was restored with a glass ionomer restoration (Fuji II LC, GC America, Chicago, IL, USA). NSRCT was completed as in case #1. The tooth and restoration were reduced to a level 2–3 mm coronal to the gingiva, leaving the crown out of occlusion [Figure 3]b. 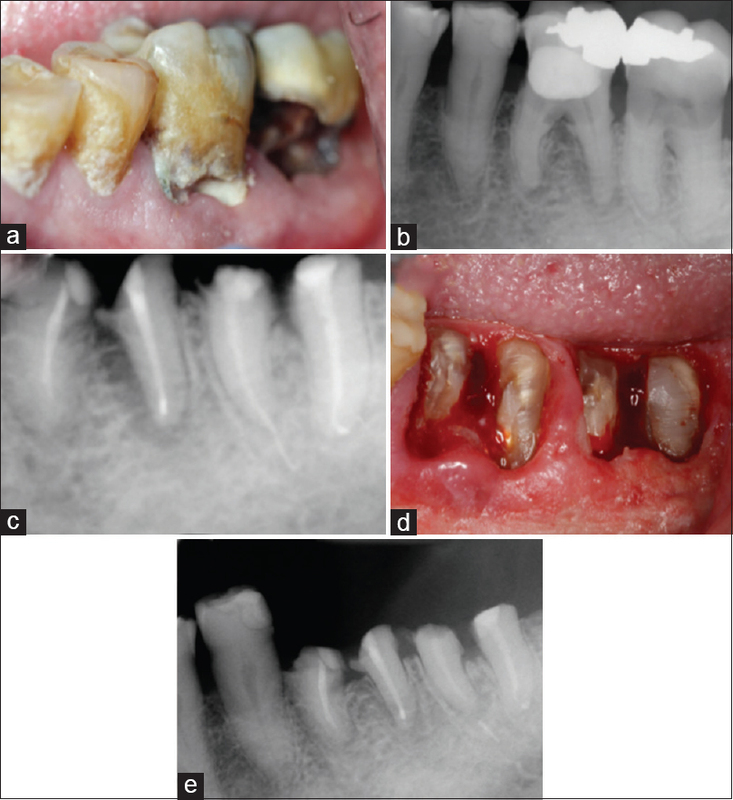 At 24 months, the patient was asymptomatic, and the gingival tissues appeared to be healthy. There was no evidence of periapical lesion on the recall radiograph [Figure 3]c.
A 66-year-old male was referred for evaluation of lower right third molar. He had received head and neck radiation 8 years previously, as treatment for Hodgkin's disease. He was also taking medication for Type-1 diabetes and hypertension. The tooth had been restored 4 years previously, but the restoration had been lost. He had been referred for extraction but declined treatment after being told that hyperbaric therapy would be required before extraction. The patient reported having an occasional dull toothache in the area of the tooth for the past 4 years. The tooth had caries extending into the pulp chamber and resulting in the total loss of the mesial and facial tooth structure. No swelling was present, and the gingival tissues appeared to be healthy. A periapical radiograph was taken, which showed extensive tooth destruction and a periapical lesion surrounding the roots of tooth 48 [Figure 4]a. The tooth was sensitive to percussion and did not respond to the cold test. A diagnosis of pulpal necrosis and symptomatic apical periodontitis was made. Treatment options were discussed, and the patient elected to have NSRCT completed, followed by decoronation and restoration. NSRCT was completed in one visit, and then the coronal half of the Gutta-percha was removed to facilitate restoration. Amalgam (Contour, Kerr Co., Danbury Conn., USA) was condensed into the canal orifices [Figure 4]b. Three years later, the patient was seen for re-evaluation. The patient reported that small pieces of the tooth had come out periodically over the past 2 years, but there was no pain or swelling during that time. A radiograph revealed no remaining tooth structure was present. However, there was a small radiolucency, and a smaller piece of amalgam shrapnel was present at the mid-root level of the distal root of the tooth [Figure 4]c. The mucosal tissues covering the socket were intact and healthy [Figure 4]d.
The primary goal for the dental treatment provided for patients with histories of head and neck radiation or bisphosphonate therapy must be to prevent the development of osteonecrosis. Several reports and guidelines indicate that nonrestorable teeth should be treated by removal of the crown and endodontic treatment. However, cases that cannot be managed by such approach, withdrawal of bisphosphonate treatment for 4–12 weeks before invasive dental surgery was advised. Risk factors for osteonecrosis include invasive dental procedures; extractions and surgical procedures, infection, and mechanical trauma to jaw bone. Reports on the incidence of osteonecrosis of the jaws development following extractions have been inconsistent. One group reported only two patients irradiated for cancer developed ORN following extraction of 197 teeth. BRONJ is another significant complication that has drawn the attention of the medical community. Several reports have indicated that the incidence of BRONJ ranges from 0.94% to 18%., It should be noted that the incidence of such complication occurs more frequently in patients receiving intravenous bisphosphonates than in patients receiving oral forms., A systematic review of 368 cases of BRONJ has shown that 4.1% were in patient receiving oral bisphosphonates compared to 91.6% in patients receiving intravenous forms. Regardless of medication route, the majority of patients affected by BRONJ have been reported to have a history of invasive dental procedures. In one study, BRONJ was developed in 93 of 439 teeth, where 19 of the 93 patients required mandibular resections to control their disease, and one died. In a recent literature review of BRONJ cases, extractions or other oral surgical procedures were considered to be the aggravating factors in 309 of 449 patients (69%), whereas 21% developed spontaneously. 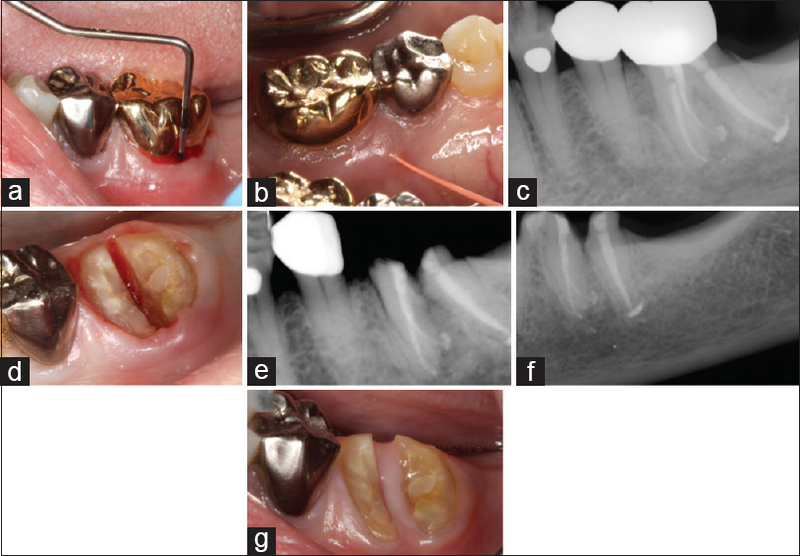 In the present case series, it appears that NSRCT followed by crown amputation on teeth that otherwise needed to be extracted, did not develop such complications. Although the endodontic outcome studies cited and the present case series support the recommendation for providing endodontic treatment instead of extracting teeth, some caution is advised when reaching that conclusion. The total number of teeth involved in the three endodontic outcome studies ,, and the present case series is 96 teeth. However, 24 teeth had received crown amputation. Therefore, more research with well-defined protocol is needed to assess the outcome. Furthermore, the endodontic success rates in the three studies varied greatly. Hsiao et al. reported healing in 74% of 34 teeth with preexisting periapical lesion in patients who were taking oral bisphosphonates. Lilly reported 91% success for 22 teeth in patients who received radiation therapy. Seto et al. evaluated radiation patients and reported that 59% of the 35 teeth treated; including 19 with crown amputations, had periapical lesion upon recall following endodontic treatment. In this case series, one of the five retained teeth had developed periapical lesion. These results suggest that the endodontic prognosis may be compromised in patients who have crown amputations. More long-term data are needed to assure that persisting periapical lesion do not expand and eventually lead to the development of osteonecrosis. Cases #1 and #4 (postradiation cases) also provide another explanation for the potentially poorer prognosis for crown amputation cases. Much like patients in another postradiation study, the patients had fibrosis of the muscles of mastication, resulting in a very limited ability to open their mouths. Both patients also had mucositis and xerostomia, which resulted in frequent interruptions in treatment. The loss of tooth structure complicated rubber dam isolation. All these problems had an adverse effect on the quality of the treatment provided in this case series. The distal canal was filled long in case #1, as were 7 of 41 roots in a study of similar cases series. Four of the 7 roots failed to heal. This was not a total surprise, since the over filling beyond the apex had been cited to negatively affect the NSRCT outcome in otherwise healthy patients. Another problem which has a negative effect on the endodontic prognosis was illustrated in the present case series. All operators reported difficulty when placing restorations in crown-amputated teeth. This problem, along with the increased susceptibility to caries in postradiation patients, can lead to coronal leakage. Crown amputation might seem an unusual approach for case #2, which had a gingival swelling and sinus tract formation. A previous study reported that crown amputation was needed in 5 of 19 teeth at subsequent appointments. The authors noted that potential complications in the involved teeth with crowns included occlusal trauma, tooth fracture, root perforation, or bone exposure from excessive force of gingival retraction. They also stated that crown removal can improve the patient's ability to clean the remaining roots, which was the apparent result in case #2. However, when the floor is severed to create separate roots, care must be exercised to avoid exposure of the interradicular bone. It was recommended to open the furcation short of the gingival attachment and incrementally fluting as the soft tissue recedes. That technique was not used in cases #1 and #2; however, it seems prudent will be recommended for the future cases. One other concern related to crown-amputation is the exfoliation of the tooth (or roots), with potential aspiration or other problems. When crown amputation was originally recommended, it was suggested that all roots would eventually be exfoliated, but they would supra-erupted first and would expose less bone then would occur with extraction. Seto et al. were the only author cited who reported exfoliation, which occurred with 8 roots. Case #4 was the only one in the case series in which roots exfoliated, but the actual exfoliation was not observed. The patient was advised regarding the importance recall examinations, which could have been useful for prevention of aspiration of the roots. None of the other teeth in the series had any evidence of supra-eruption. The four cases presented showed that the preliminary outcome for teeth with NSRCT followed by crown amputations prevented the development of osteonecrosis; however, prevention or treatment of apical periodontitis was unpredictable. It appears that frequent recalls are needed to manage lost restorations and exfoliating roots in a timely manner. The present results and lack of comprehensive data suggest that further research on this subject is needed to determine the best option for managing nonrestorable teeth in postradiation patients or patients taking bisphosphonate drugs. Chrcanovic BR, Reher P, Sousa AA, Harris M. Osteoradionecrosis of the jaws – A current overview – Part 1: Physiopathology and risk and predisposing factors. Oral Maxillofac Surg 2010;14:3-16. O'Dell K, Sinha U. Osteoradionecrosis. Oral Maxillofac Surg Clin North Am 2011;23:455-64. Williams WB, O'Ryan F. Management of medication-related osteonecrosis of the jaw. Oral Maxillofac Surg Clin North Am 2015;27:517-25. Ruggiero SL. Bisphosphonate-related osteonecrosis of the jaw: An overview. Ann N Y Acad Sci 2011;1218:38-46. O'Ryan FS, Lo JC. Bisphosphonate-related osteonecrosis of the jaw in patients with oral bisphosphonate exposure: Clinical course and outcomes. J Oral Maxillofac Surg 2012;70:1844-53. Carl W, Schaaf NG, Chen TY. Oral care of patients irradiated for cancer of the head and neck. Cancer 1972;30:448-53. McLeod NM, Brennan PA, Ruggiero SL. Bisphosphonate osteonecrosis of the jaw: A historical and contemporary review. Surgeon 2012;10:36-42. Lilly JP, Cox D, Arcuri M, Krell KV. An evaluation of root canal treatment in patients who have received irradiation to the mandible and maxilla. Oral Surg Oral Med Oral Pathol Oral Radiol Endod 1998;86:224-6. Al Shareef AA, Saad AY. Endodontic therapy and restorative rehabilitation versus extraction and implant replacement. Saudi Endod J 2013;3:107-13. Seto BG, Beumer J 3rd, Kagawa T, Klokkevold P, Wolinsky L. Analysis of endodontic therapy in patients irradiated for head and neck cancer. Oral Surg Oral Med Oral Pathol 1985;60:540-5. Thakkar SG, Isada C, Smith J, Karam MA, Reed J, Tomford JW, et al. Jaw complications associated with bisphosphonate use in patients with plasma cell dyscrasias. Med Oncol 2006;23:51-6. Stumpe MR, Chandra RK, Yunus F, Samant S. Incidence and risk factors of bisphosphonate-associated osteonecrosis of the jaws. Head Neck 2009;31:202-6. King AE, Umland EM. Osteonecrosis of the jaw in patients receiving intravenous or oral bisphosphonates. Pharmacotherapy 2008;28:667-77. Pazianas M, Miller P, Blumentals WA, Bernal M, Kothawala P. A review of the literature on osteonecrosis of the jaw in patients with osteoporosis treated with oral bisphosphonates: Prevalence, risk factors, and clinical characteristics. Clin Ther 2007;29:1548-58. Woo SB, Hellstein JW, Kalmar JR. Narrative [corrected] review: Bisphosphonates and osteonecrosis of the jaws. Ann Intern Med 2006;144:753-61. Marx RE, Sawatari Y, Fortin M, Broumand V. Bisphosphonate-induced exposed bone (osteonecrosis/osteopetrosis) of the jaws: Risk factors, recognition, prevention, and treatment. J Oral Maxillofac Surg 2005;63:1567-75. Hsiao A, Glickman G, He J. A retrospective clinical and radiographic study on healing of periradicular lesions in patients taking oral bisphosphonates. J Endod 2009;35:1525-8. Cox FL. Endodontics and the irradiated patient. Oral Surg Oral Med Oral Pathol 1976;42:679-84. Ricucci D, Langeland K. Apical limit of root canal instrumentation and obturation, part 2. A histological study. Int Endod J 1998;31:394-409. Ettinger RL, Qian F. Postprocedural problems in an overdenture population: A longitudinal study. J Endod 2004;30:310-4.